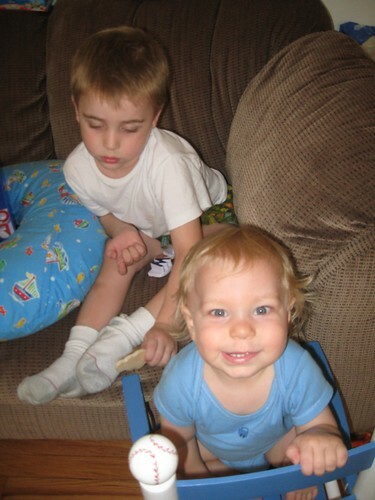 my kids are not snoring – through the night at least! Clearly the two boys have a deal between them to have Mommy and Daddy up each and every night. Typically this is between 12-2 in the morning. Most nights it seems to be a certain 14 month old little boy. NHL has slept the past two nights since he gave us the big scare. Thank goodness since I do not think my heart could take that again. Thursday afternoon we had a horrible storm come through the area. In addition to the thunder and lightning, flooding rains joined in the fun. 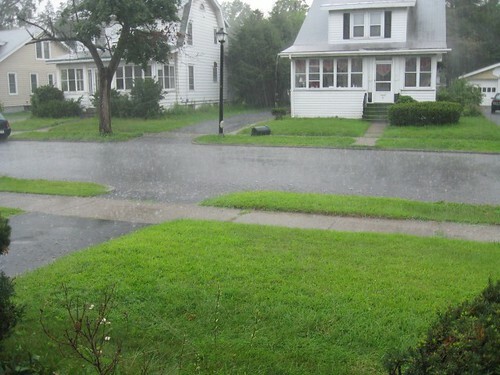 The city received over an inch of rain during the first burst in less than an hour. I often complain about the threat of floods in my basement, but we were lucky nothing happened here. We think it was thanks to DGS coming that morning and cleaning out the sewers. Perhaps they were admitting to a problem, but I am sure they will never fess up. Sure we lucked out this one time, but others did not have this fate. Other parts of the city turned into lakes. Cars in parking lots in certain sections floated away as people were stranded inside buildings. One woman had to be recused from her car as a sewer suddenly started to spew water and form a lake around her. Her car could not be opened since the power system failed and she was trapped. Along with this other parts of the city had the pleasure of finding raw sewage in their lawns and basements. The city of course is claiming little or no responsibility, like when it happened here. Sad that with all of the taxes we pay nothing is done to fix this outdated system that is not working. During the rain on Thursday I went outside on our porch to get some photos. 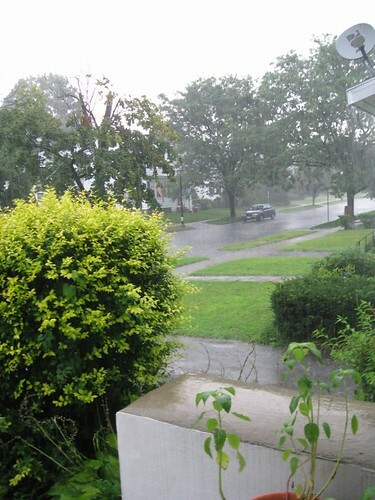 You can barely see that the street in front of the house was a quick flowing river, but it was. Yesterday was a lazy PJ kind of day here in Angel Land. I was beyond exhausted from no sleep and did not want to fight more rain storms with the boys. We stayed in during the day. The boys were bouncing off the wall. The little munchkin learned how to scare Mommy some more. Sorry no photos of this trick with no hands, I was too busy stopping him at the time! Not long after this JL arrived home from work. I went to swap the cars around for the weekend. I knew the sky was quickly getting black. Of course as I moved the first car out of the driveway the sky started to dump more rain. I was soaked when I came into the house. A few minutes later I had an idea. It was raining, but no thunder or lightning. 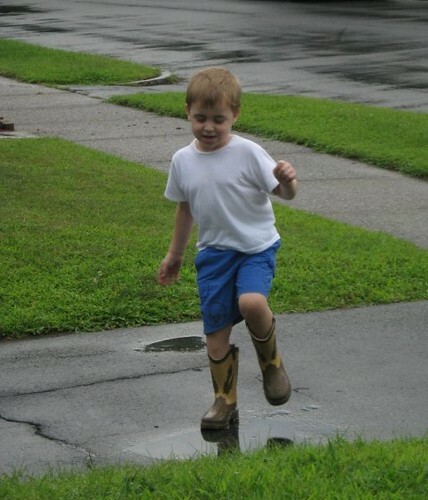 NHL needed to run and this was the perfect chance to test our the cowboy rain boots that Aunt L bought him years ago. 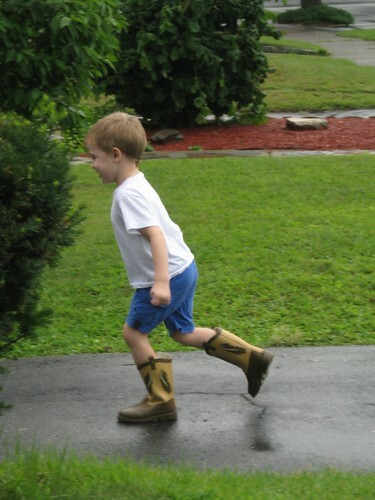 I quickly put shorts and boots on him and took him outside to puddle stomp. When we first went out it was lightly raining, so I snapped a few quick ones. Then he found some giant puddles in the back of our driveway and was soaked from splashing up a storm. It was fun to watch his reaction when I told him to go and jump in a puddle, something he is always told to avoid. Today we hope to catch some rays from the sun before the next few days throw even more rain on us. Love the puddle jumping pictures! 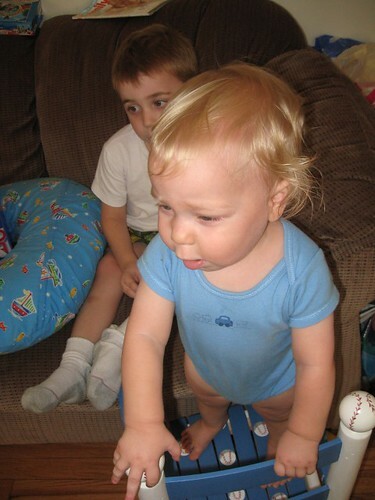 When I was his age, I love to twirl around with an umbrella like they do in “Singin’ in the Rain.” Fun times! I hope you get some sun too and some outside time for the boys. Too much time inside really does turn them into little monsters, been there see that one too. Although we’ve had a lot of rain down here too and flood warnings all the time for the last week or so. I have to agree to be being a little blessed in not having our dirt roads flooded out. What cuties! Rainy days can be fun but it sounds like you guys need some good weather! !